Acids give wines their characteristic crisp, slightly tart taste. Acids occur naturally during the growing of grapes and as a part of the fermentation process. Natural acids have the freshest, purest acid tastes. Among grapes they are tartaric, malic and citric. Tartaric acid is the principal acid in grapes and is the component that promotes a crisp flavour and graceful ageing in wine. A moderate amount of wine’s acid comes from malic acid, which contributes to fruitiness. A small amount comes from citric acid. Wine also contains traces of other acids. The least desirable acid in wine is acetic acid, which, when present in more than a nominal amount, give wine a sour or vinegary aspect. Future considerations might well be shaped by realising that tartaric produces the sharpest taste, malic the most pronounced, citric the freshest, lactic the weakest, acetic the bitterest and most odorous, and succinic the saltiest. Total acidity, also known as titratable acidity, is the sum of the fixed and volatile acids. Total acidity directly effects the color and flavor of wine and, depending on the style of the wine, is sought in a perfect balance with the sweet and bitter sensation of other components. Proper acidity in wine is what makes it refreshing and an ideal accompaniment to food. The proper acid level of wine varies, with sweeter wines generally requiring somewhat higher levels to retain the proper balance. Titratable acidity relates to the amount of acid in solution as a percentage or grams/Litre (obtained by multiplying %TA by 10). For example, TA of 0.80% becomes 8 g/L. pH is related to an acid’s strength in solution and is measured on a logarithmic scale. Although TA and pH are interrelated, they are not the same thing. pH determines the effects acids have on wine. The effective acidity (pH) of a solution depends on the concentration of all acids in the solution as well as their tendency to dissociate hydrogen ions. A Perfect Solution at an Affordable Price! Hanna Instrument’s HI84502 is an easy to use, fast and affordable automatic mini titration system designed for testing titratable acidity levels in wine. It includes a pre-programmed analysis method and uses a powerful algorithm in order to determine when the titration reaction has reached completion. HI 84502 uses piston driven Pump with Dynamic Dosing providing highly accurate , repeatable results in minutes. Logs data up to 400 samples. Perfect feature to keep track of your wine characters. Moreover, it displays in-depth data on titration, which can then be stored and exported to either a USB drive or PC using the USB connection. 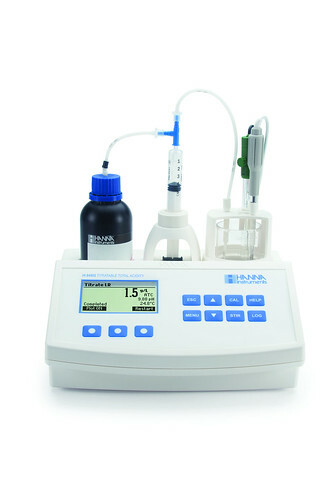 HI 84502 also operates as an independent pH meter allowing users to measure effective acidity.